Loads of media recaps from the big game last night - I've already posted some, but here are a few more. The Mountaineers outrebounded Pitt, 21-12, in the first half. But WVU switched to a 1-3-1 zone and Pitt took advantage by outrebounding the Mountaineers 12-4 in the overtimes. "That changed the game," Wanamaker said. "Late in the game, we started rebounding, boxing out. Early on, they were in control of the game. Once we started rebounding, we started getting back in control of the game." "They competed, and Jamie's teams do that. (But) they couldn't have won the game without a lot of help from us. (And) we couldn't stop their penetration, so we went to the 1-3-1 (zone). And it's hard to rebound out of the 1-3-1." Gibbs scored 24 points including four-for-six from the free throw line. He missed the second of two free throws with seven seconds left in the first overtime. 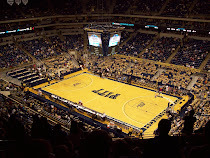 Had he hit the second free throw, Pitt would have probably sealed the win but his miss allowed Bryant to hit a three with seven seconds left to tie the game and send it into a second overtime. He redeemed himself when he stepped to the line in the third overtime with ten seconds left and hit both free throws to give Pitt a three-point lead. "I have enough confidence in myself to treat every shot the same," Gibbs said. "I put every miss behind me." Gibbs has actually struggled a bit recently from the line. He's shooting 90% on the season, but in the past four games, he's missed seven of them and has shot only 75%. “We needed a win like this to make us believe we could do this again,” said Pitt’s Gilbert Brown, talking about a recently snapped stretch in which the Panthers lost four of five games. 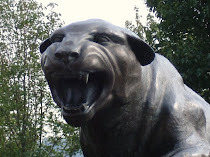 Pitt had of course won the past two games, but the competition was a bit suspect. This is Pitt's second big win of the season over a top five ranked team. That hasn't happened since...well, last season, when Pitt beat #1 ranked UCONN twice. After Travon Woodall nailed a jumper to close the deficit to 68-65 with 31 seconds left, Nasir Robinson stole the ball from West Virginia’s Darryl Bryant off the inbound and relayed it to an open Ashton Gibbs, who knocked down the game-tying shot. That play was so crazy, it's hard to fault WVU for not finding Gibbs. They expected to have the ball out of bounds and Wannamaker found Gibbs pretty quickly. It's not like Pitt had been in a half-court offense for 30 seconds and WVU just managed to let Gibbs spring free. Meanwhile, a West Virginia columnist complains about...traffic? Um, okay. You're exiting a major city after a sporting event AFTER said city recently had two feet of snow dumped on it and you didn't expect traffic? Lost in all the talk by our beloved Mountaineer fans is that despite their complete breakdown at the end of regulation they had not one, not two, but THREE chances to win in each of the three overtimes. I won't dispute the fact that Pitt really had no business winning this game based on the way they played in regulation. But in overtime, the games start completely even. Even if you blow a lead and are forced to play overtime, you've got an equal chance to win. You can talk all you want about momentum and such, but the fact is that Pitt, by the third overtime, was missing Jermaine Dixon, Brad Wanamaker, and Travon Woodall. The Panthers could have easily folded without some of its best players and still found a way to win. WVU should not only be disgusted about how they allowed Pitt to tie the game in regulation, but also about how they went into the fetal position in the overtimes despite Pitt missing several key pieces. One key thing we should be talking about (other than the traffic, of course) is that Pitt has now won two games they really had no business winning. Pitt should have been beaten in regulation by both WVU and Louisville and could easily be 17-8 and only 6-6 in the conference. That would be enough to put Pitt squarely on the bubble and really could have forced them to win most of these remaining games left. As it is, Pitt really has little chance of missing the tournament and may even be in line for a fairly high seed. It's a fine line, folks.